In Part 4 we learned how to use and configure compliance settings in order to enable or disable certain configurable features on iOS devices. We enforced a Password requirement and enforced a minimum password length as this is a common requirement for organizations. 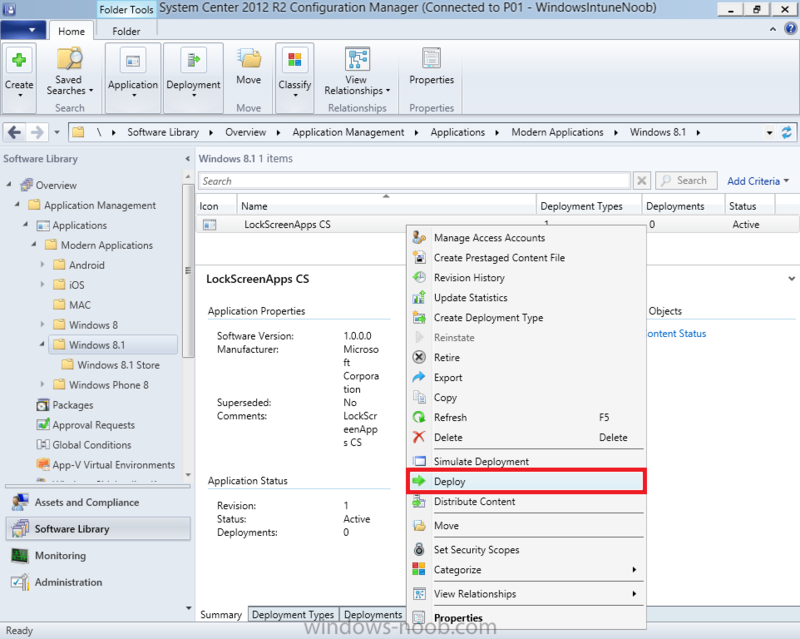 In Part 5 we enabled support for Windows 8.1 devices (both Windows RT 8.1 and Windows 8.1 Enterprise) so that they could be managed via System Center 2012 R2 Configuration Manager integrated with Windows Intune. 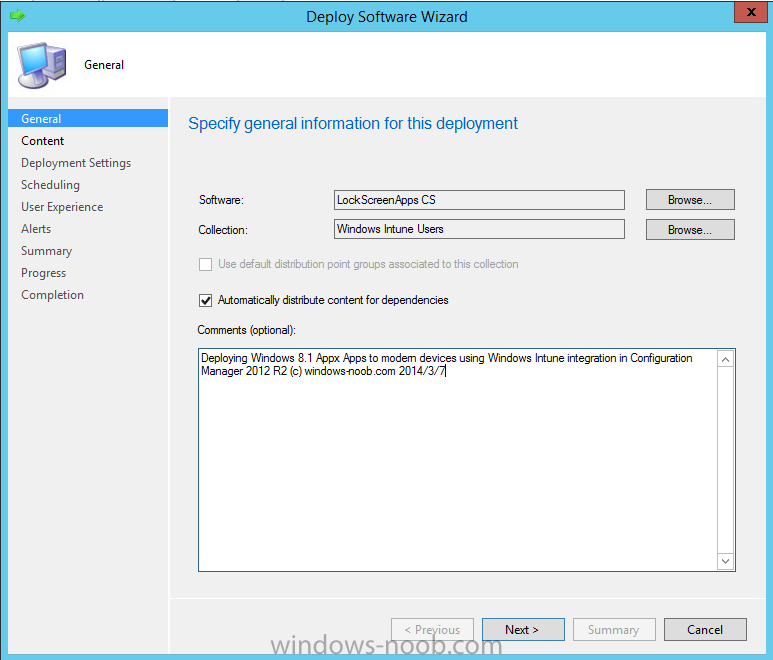 Now we will look at deploying Windows 8.1 apps (appx) to Windows 8.1 devices. 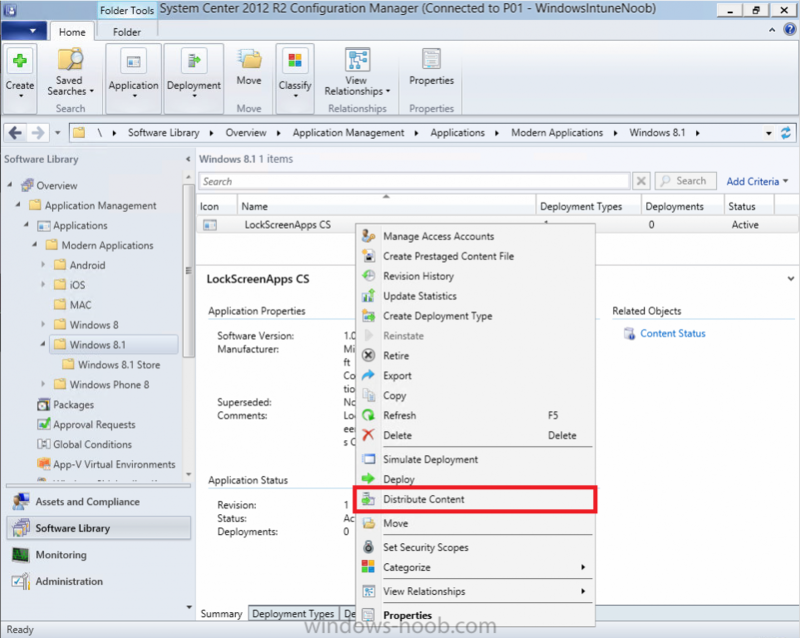 Mobile apps that are deployed using Configuration Manager appear in the company portal on mobile devices. You can deploy sideloaded apps or links to application stores to enrolled devices. 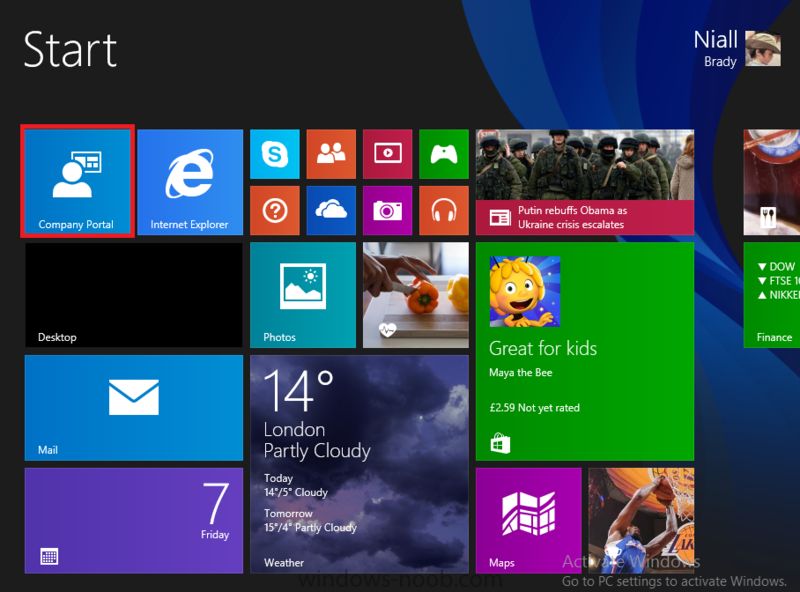 Client computers that run different versions of Windows 8 have different requirements for enabling the sideloading of apps. For example, you must configure the sideloading key on a computer that runs Windows 8 Enterprise if the computer is not joined to a domain. For more information about these requirements, see the following section in Technet:- Windows 8 Sideloading Requirements. Note: In case it's not clear in the table below, if you want to sideload apps you need a sideloading key. 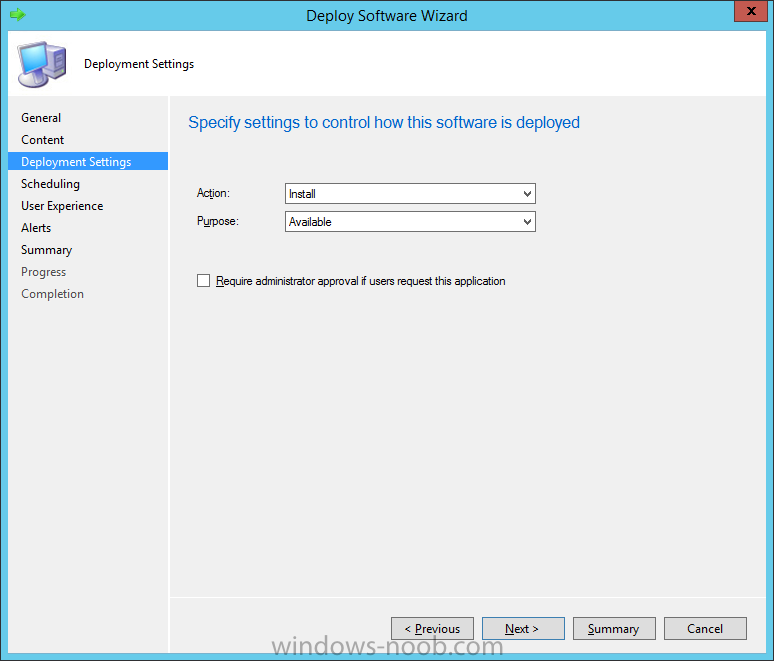 To create a sideloading key expand Software Library, Application Management, Windows Sideloading Keys and right click, choose Create SideLoading key and enter the details. 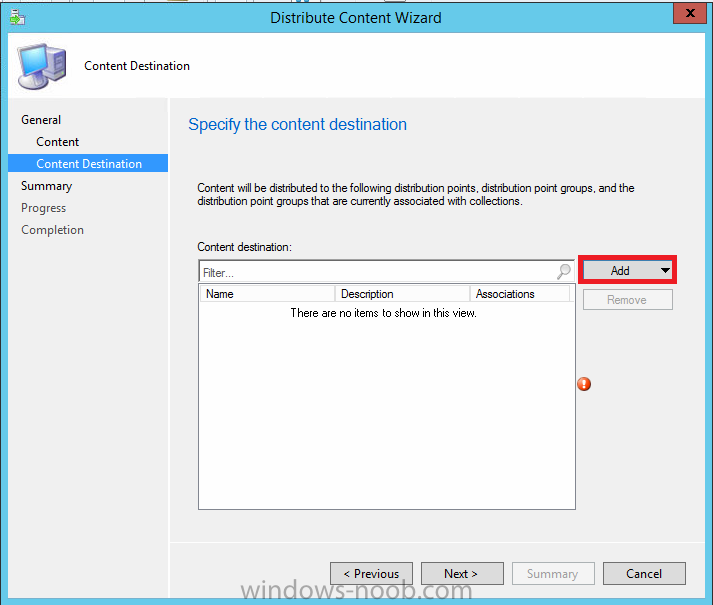 For the purposes of this guide I will assume that you have entered your sideloading key(s) prior to commencing the steps below. 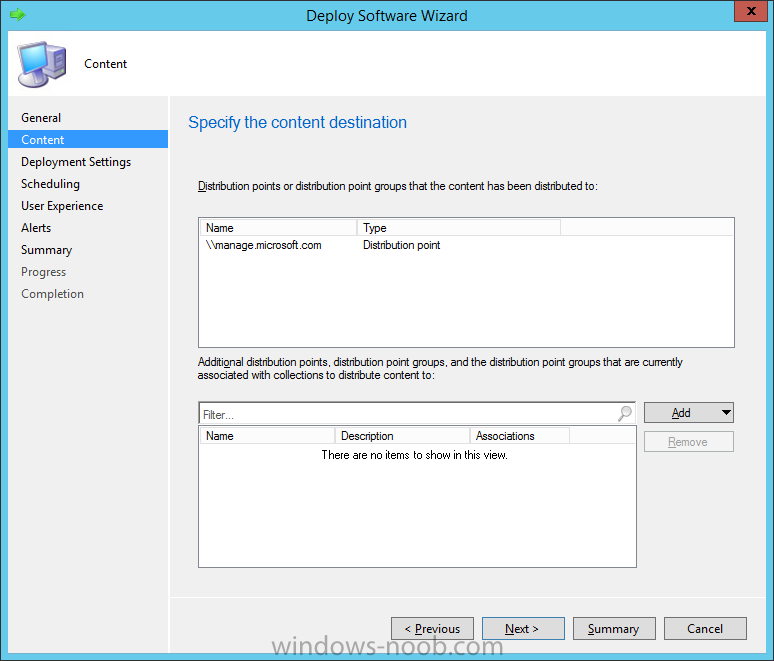 You can enable sideloading for this scenario by installing a sideloading product key on the computers. 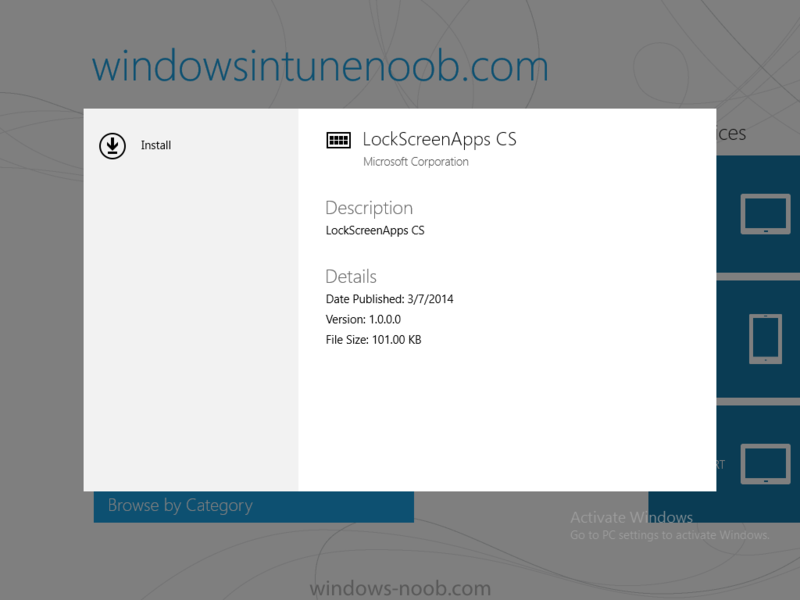 For more information about sideloading product activation keys, see Microsoft Volume Licensing. Additionally, the article How to Add and Remove Apps describes how to use the Windows Software Licensing Management Tool (Slmgr.vbs) to add and activate the sideloading product key. 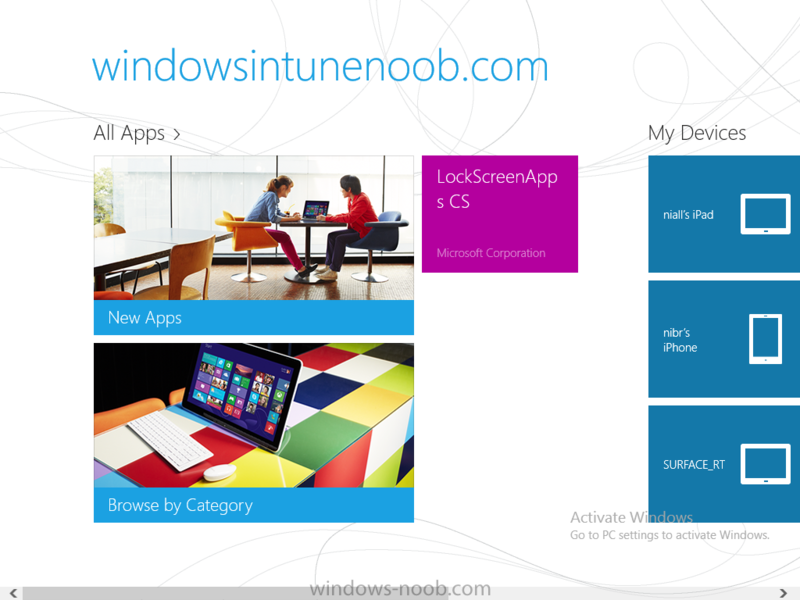 First of all we need to configure Windows 8 computers to allow direct installation of Windows 8 apps (appx apps). 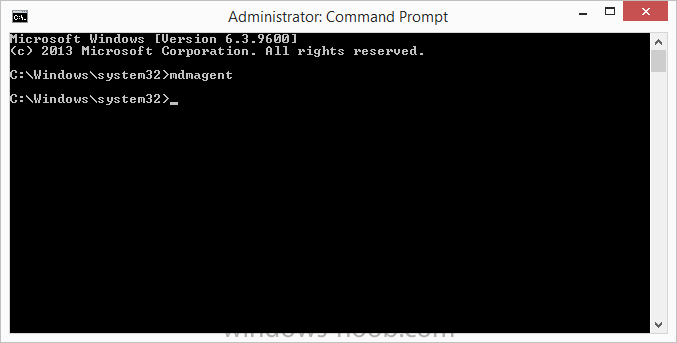 To do so, you would normally use group policy to configure the following sideloading registry settings, however our Windows 8.1 devices are not domain joined so Group Policy is out of the question. 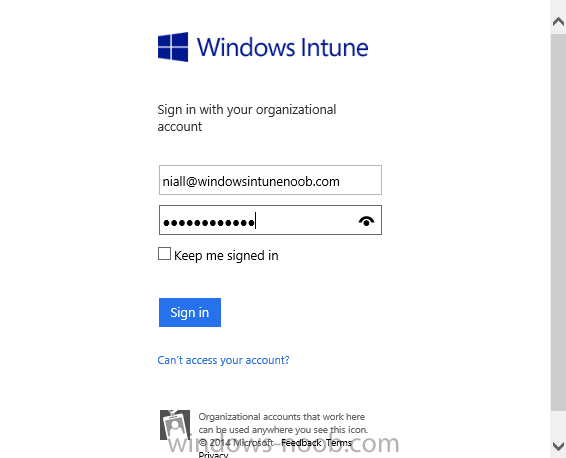 As we cannot currently deploy registry entries via Windows Intune integrated with Configuration Manager you'll need to do this step manually or use a script. 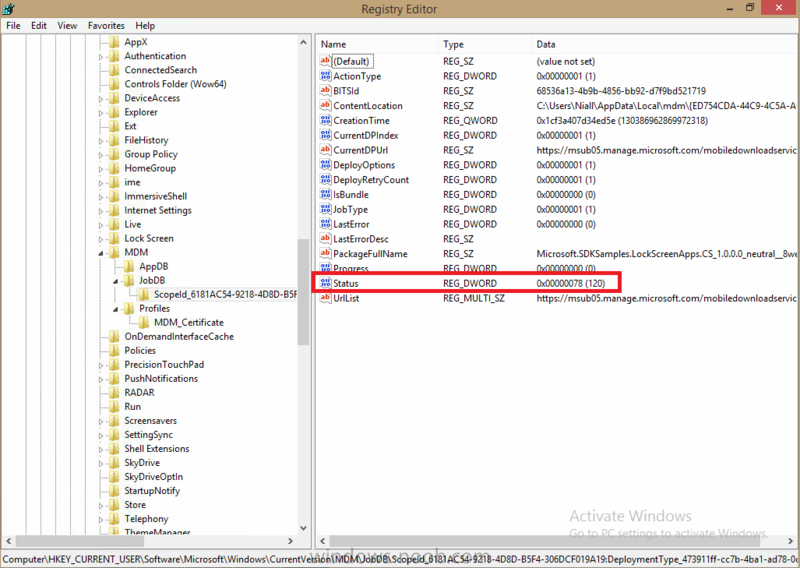 As our (modern) Windows 8.1 devices are workgroup joined we need to manually create the following registry key, so please save the text below into a file called AllowAllTrustedApps.reg and then run it on your Windows 8.1 clients. 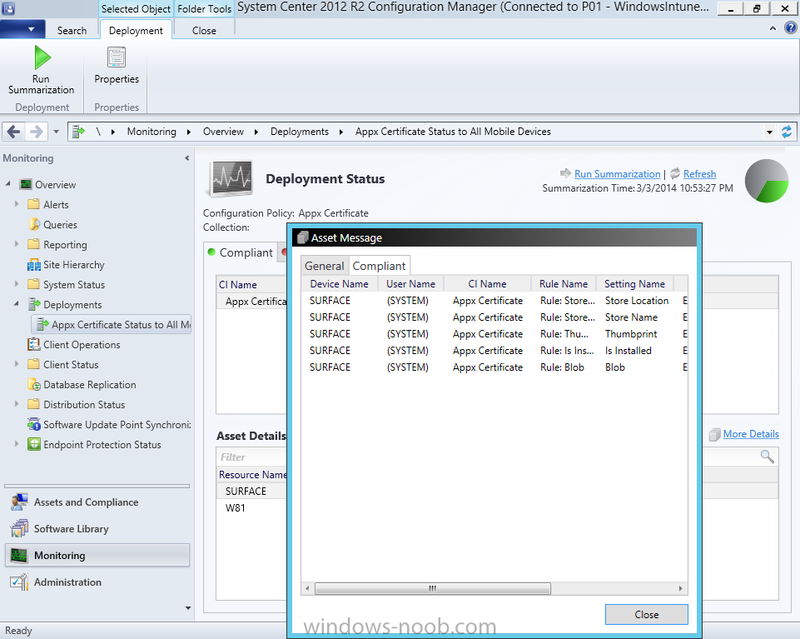 A Certificate is required to ensure that the app is trusted. 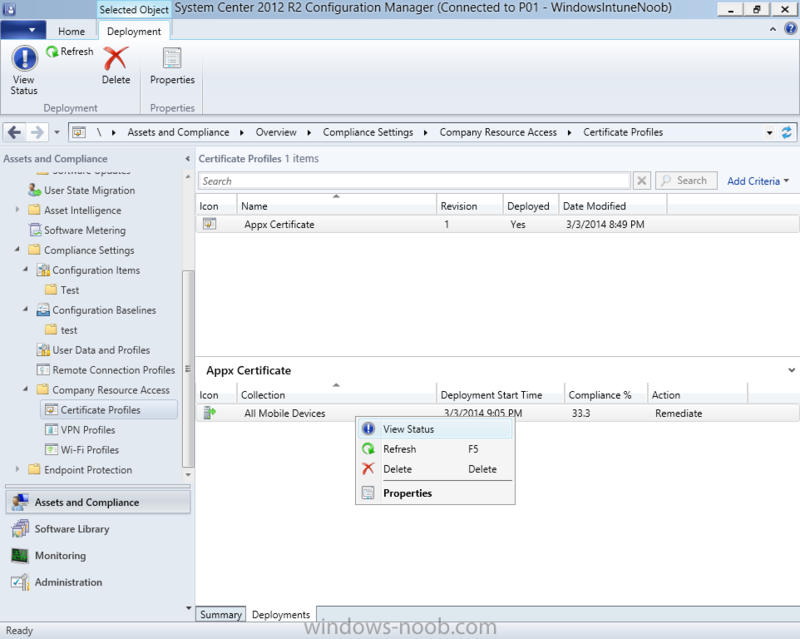 Without the correct certificate, you can't sideload apps. 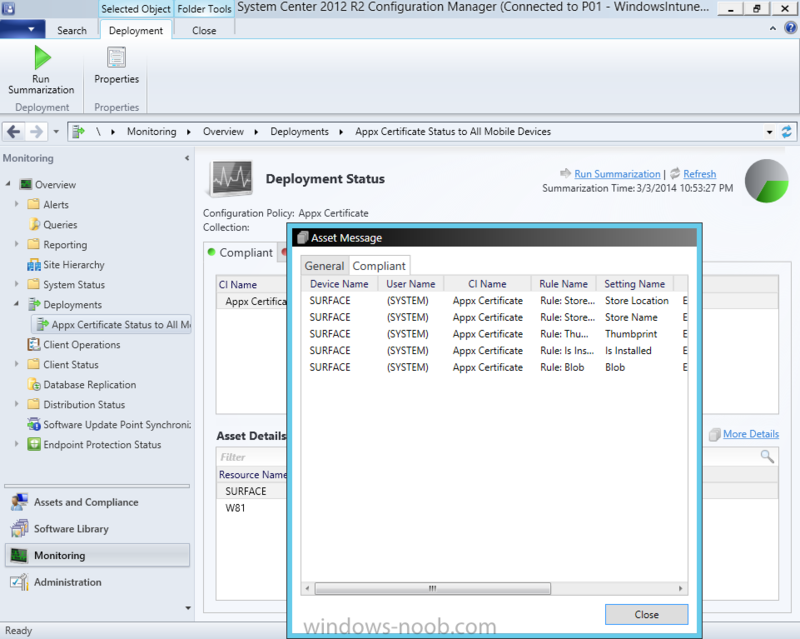 As we will be installing an Appx app using the Company Portal we therefore need the certificate in place. Tip: Sideloading of apps is when you install them using a method other than the via the Store (sideloading is appropriate for other platforms as well, such as iOS, Windows Phone, Android). 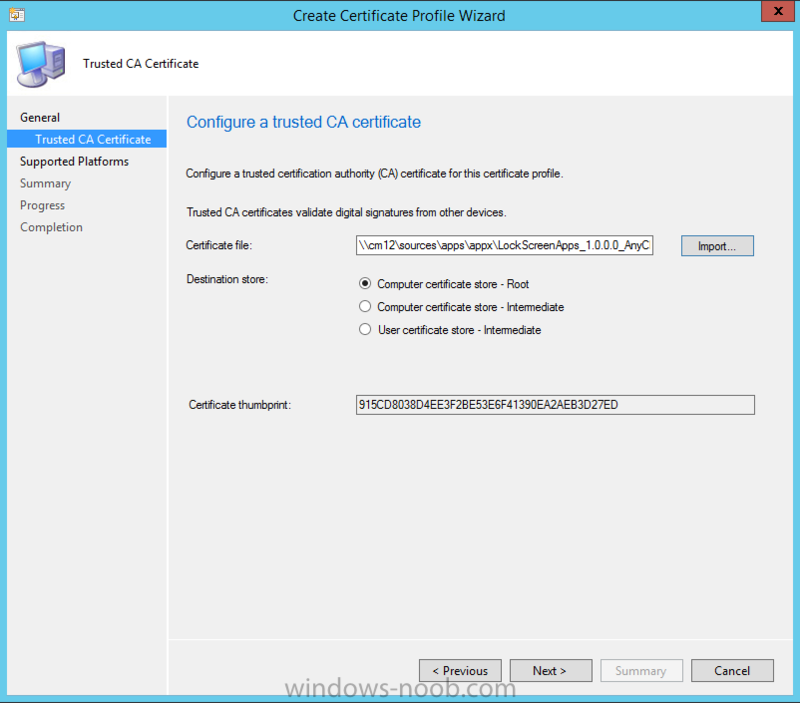 This certificate does not have to be rooted to a trusted certification authority; it just has to be trusted by your PCs. 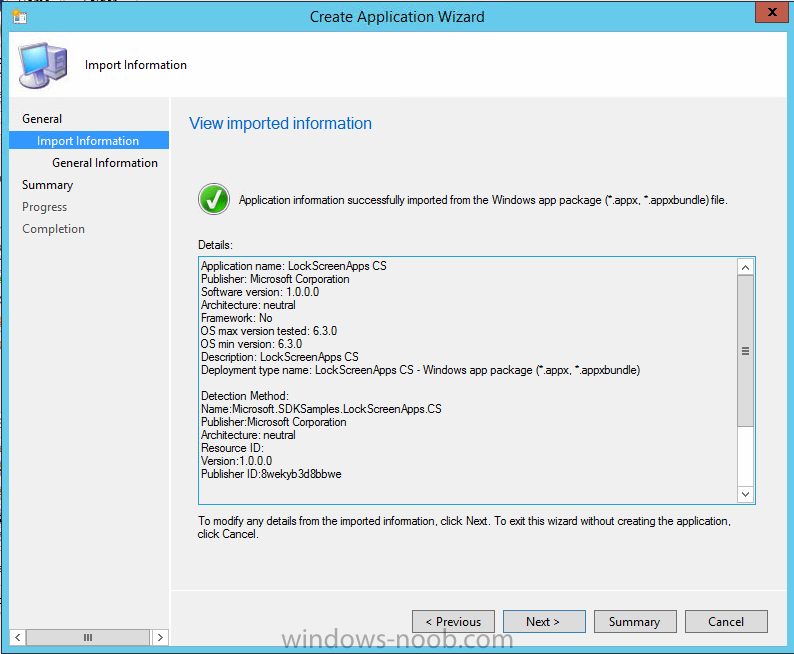 The Publisher Name in the package manifest must match the Publisher Name in the certificate that is used to sign the app package. 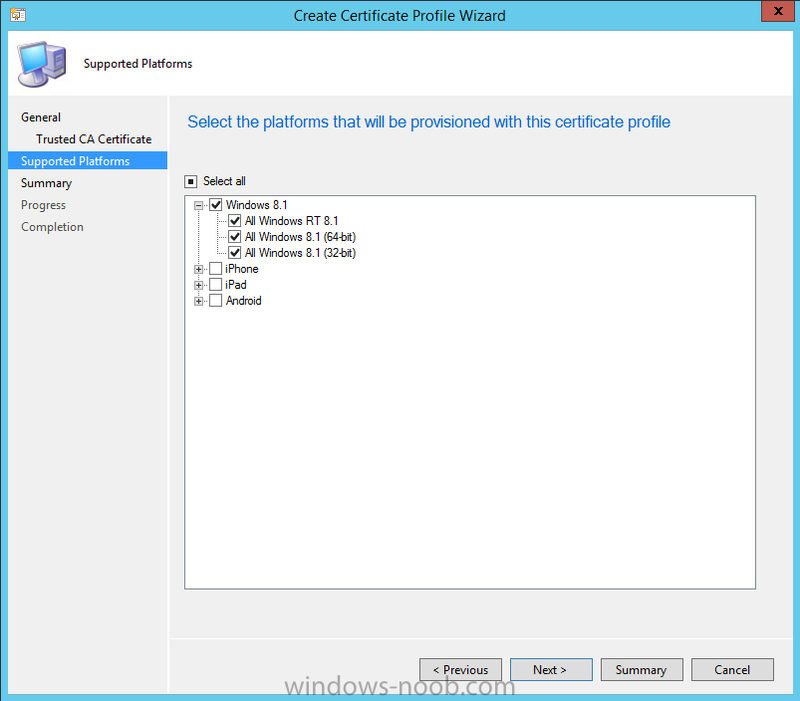 Windows trusts many Certificate Authorities without any additional configuration. If the certificate is from one of these already trusted authorities, you don’t need to deploy and manage additional certificates to the targeted PCs. 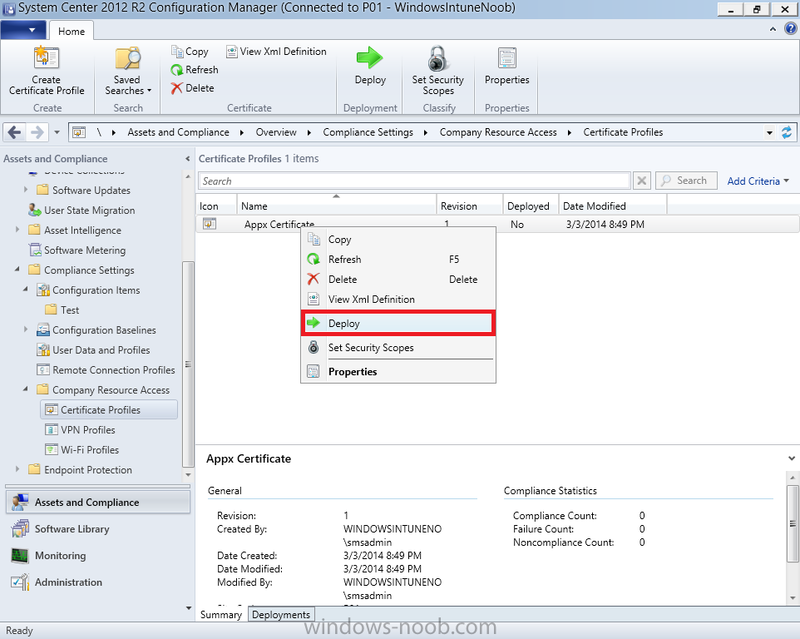 You also can use your company's internal Certificate Authority to sign the app, as long as you ensure that the CA certificate is installed in the Windows images of the targeted PCs. 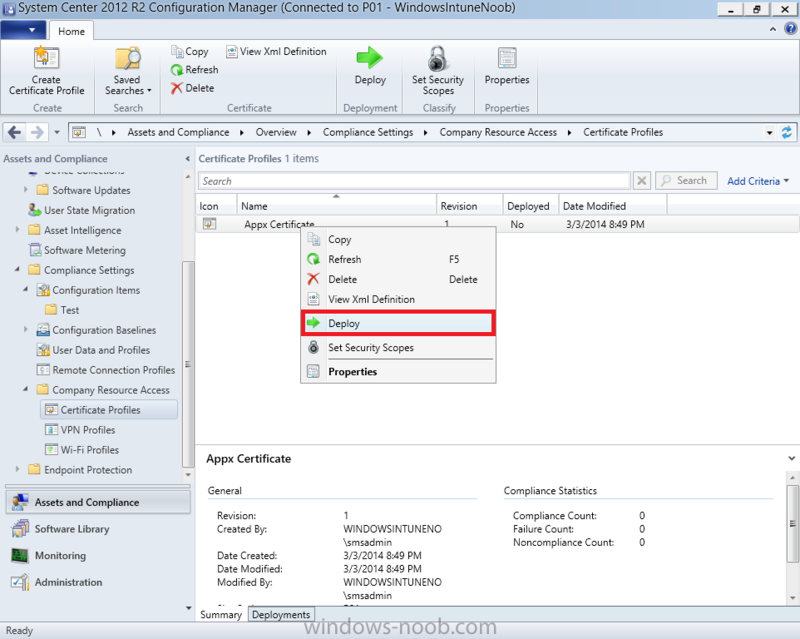 Note: Visual Studio provides a self-signing test certificate that you can use to test apps internally. Microsoft recommends that you use these self-signed certificates for internal testing only and that you do not use them on production networks for enterprise deployment. 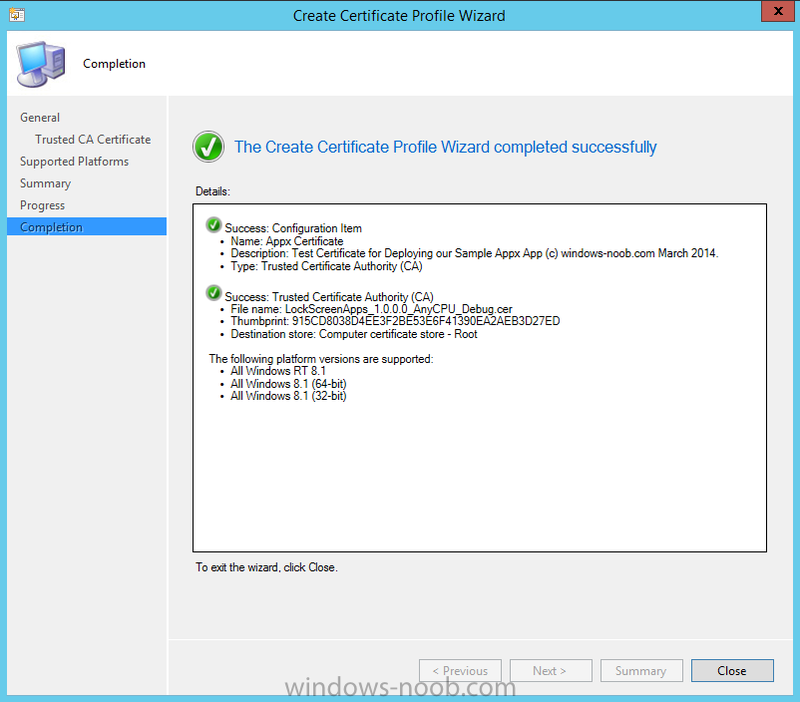 We can use a new feature in Configuration Manager 2012 R2 to deploy Certificate Profiles. 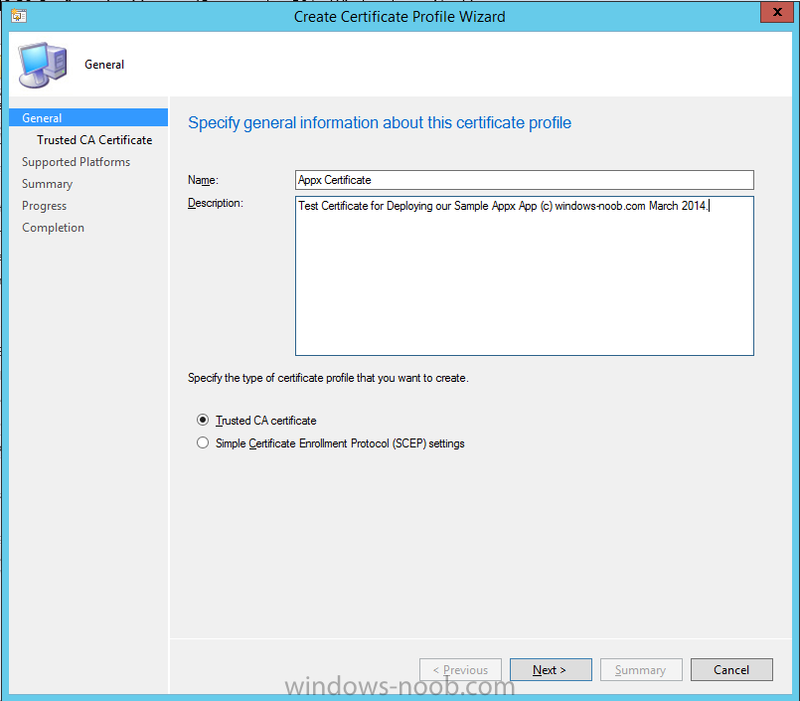 Certificate profiles in System Center 2012 Configuration Manager works with Active Directory Certificate Services and the Network Device Enrollment Service role to provision authentication certificates for managed devices so that users can seamlessly access company resources. For example, you can create and deploy certificate profiles to provide the necessary certificates for users to initiate VPN and wireless connections. 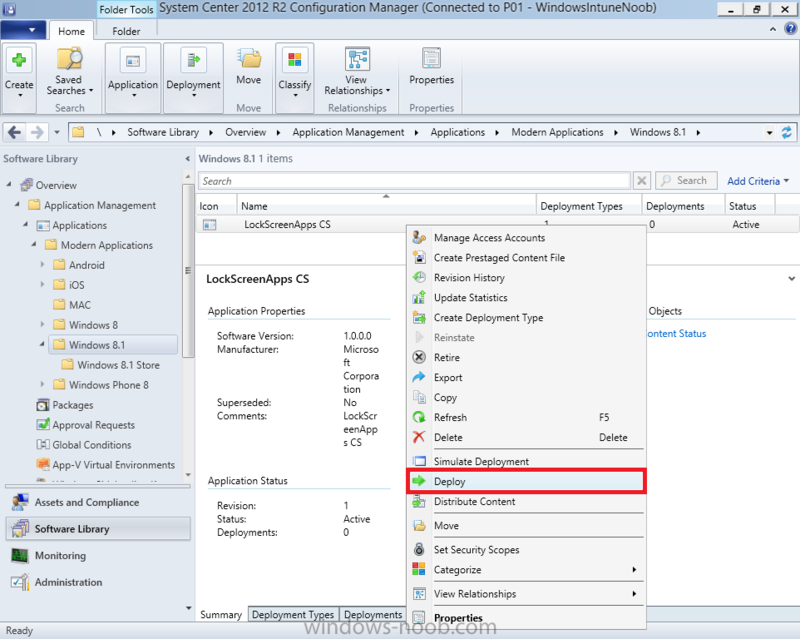 Give it a suitable name and description, In this blog post you are learning how to Deploy Appx apps to modern (mobile) devices and this example will be sufficient for our needs, we can use the certificate we created when we created out sample Appx app in this post. 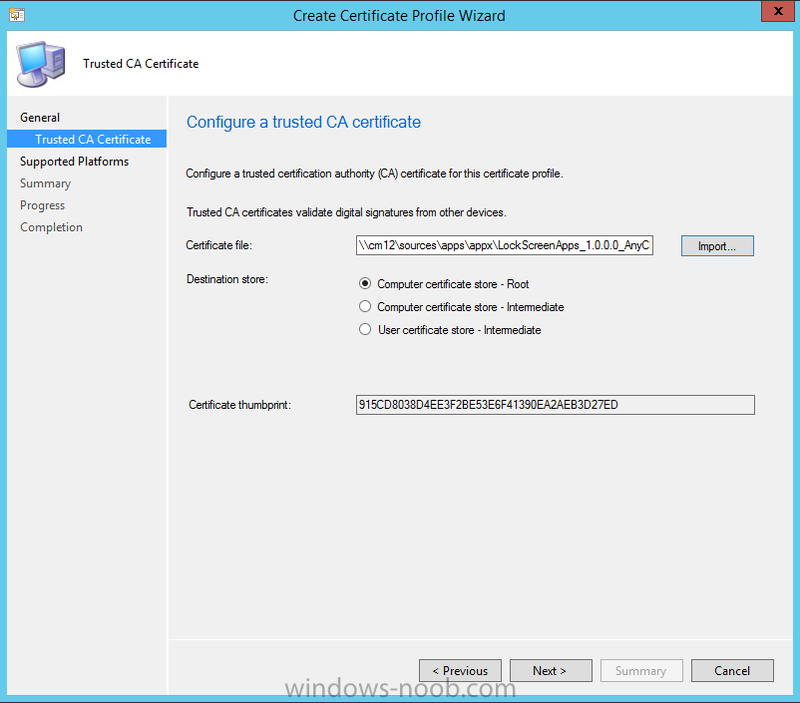 Browse to the folder where you've got your Appx certificate (or to the folder where you have a Windows 8.1 appx app source files plus the self signed certificate) and select the certificate and then choose open. 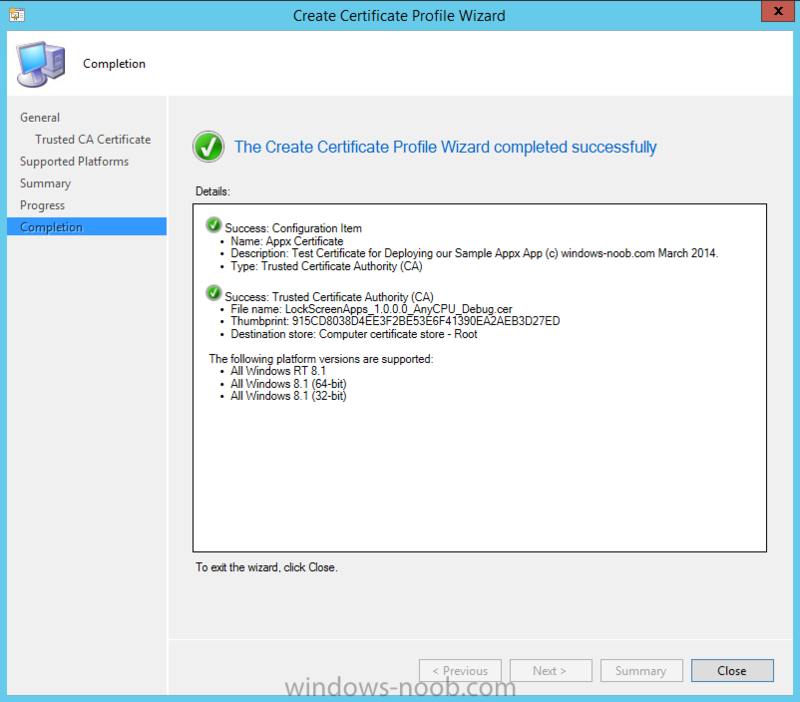 The certificate profile is created, click close. 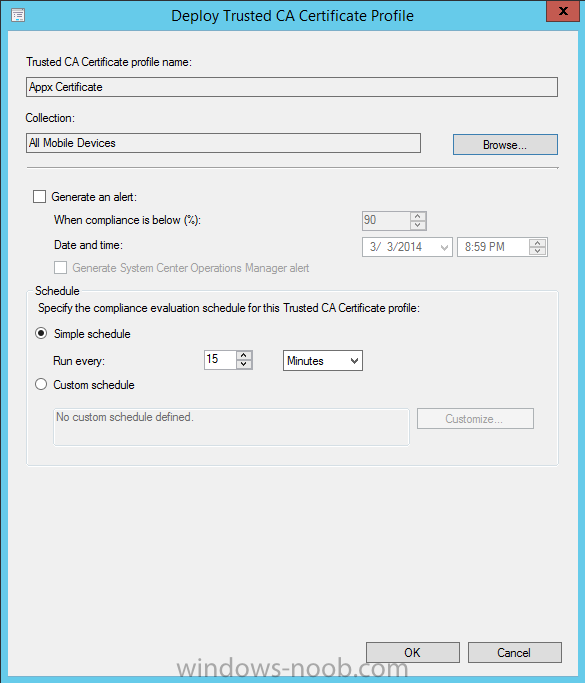 Now that we've created our test appx certificate profile, we will deploy it to our Windows 8.1 modern devices. 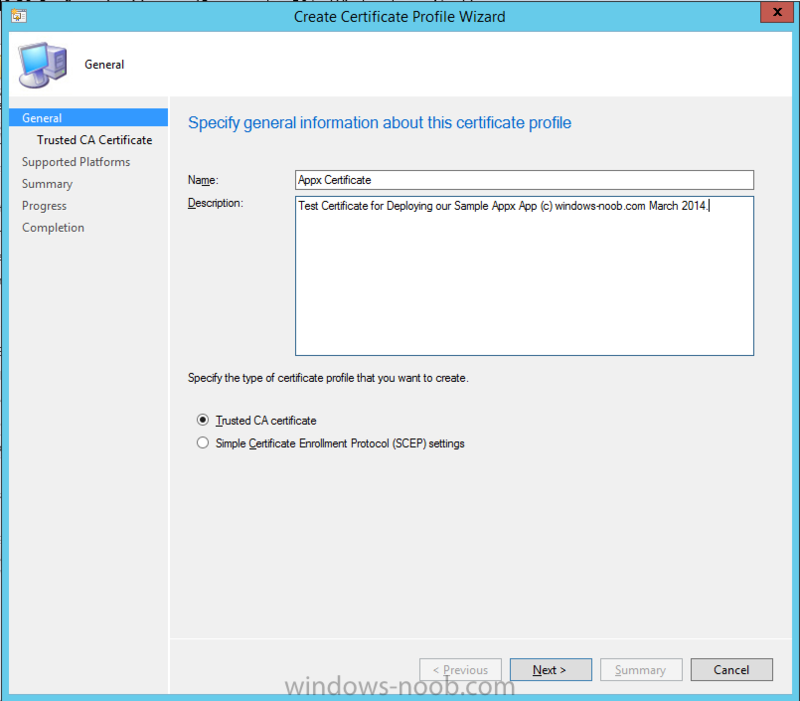 Right click the certificate profile and choose Deploy. 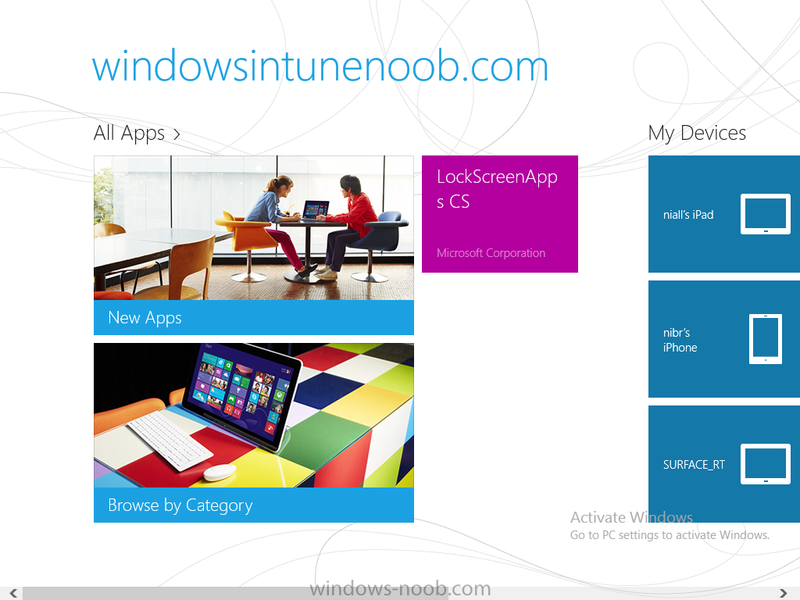 and select the All Mobile devices Device collection. Note: In the screenshot below I have not changed the compliance evaluation schedule from the default setting of 15 minutes, which in a lab is ok, however in production you'd want to set it to something more realistic like once a week. 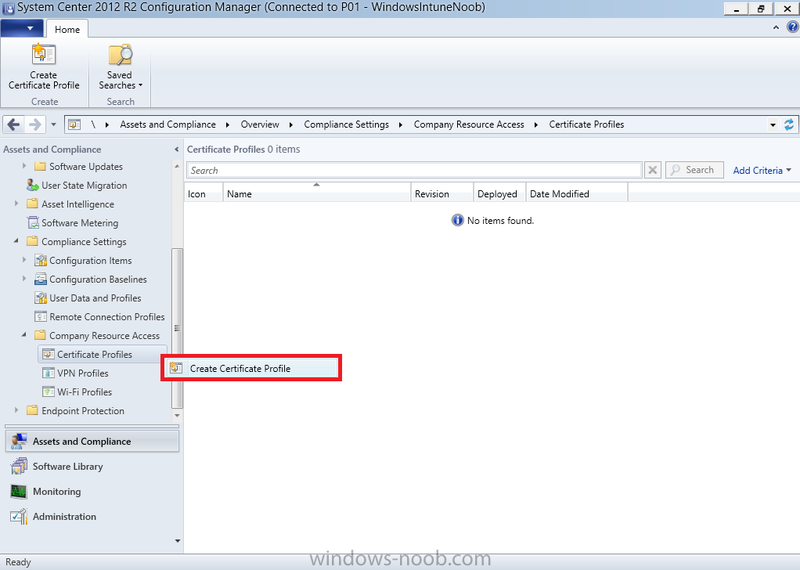 Now that the Certificate is deployed it's a waiting game, the device must receive it's policy which by default is once every 24 hours. 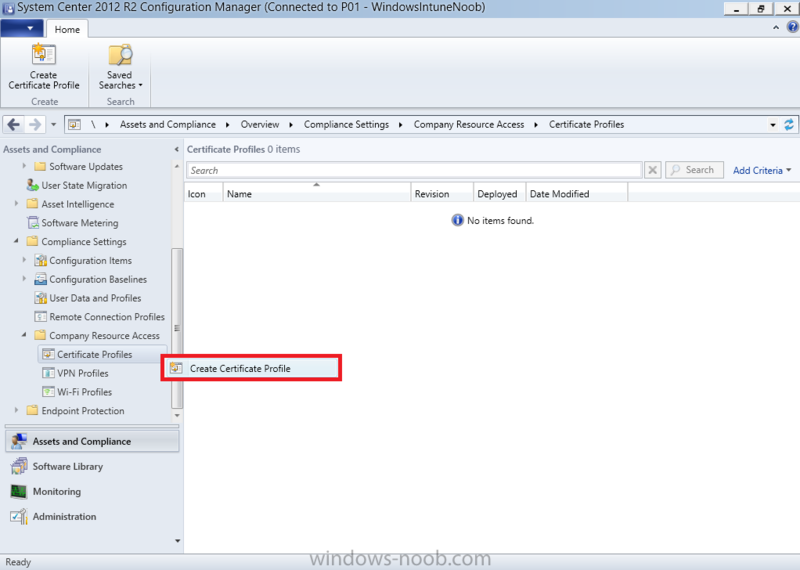 Once it has received policy you can verify that the certificate is actually deployed by bringing up the Certificates MMC on one of your Windows 8.1 devices. 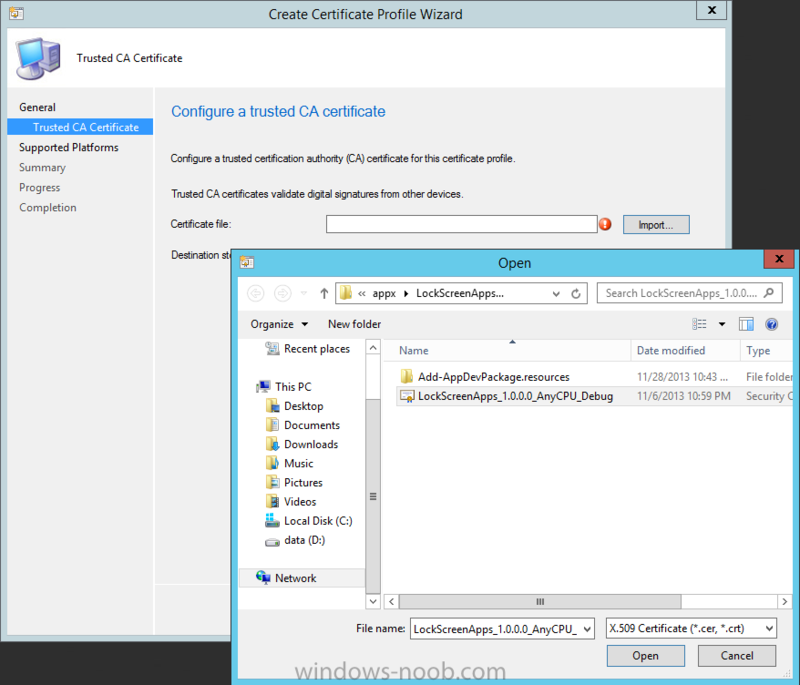 In the screenshot below we are viewing a certificate on two separate computers, the one on the left is on the CM12 server and the one on the right is on a Windows 8.1 client. 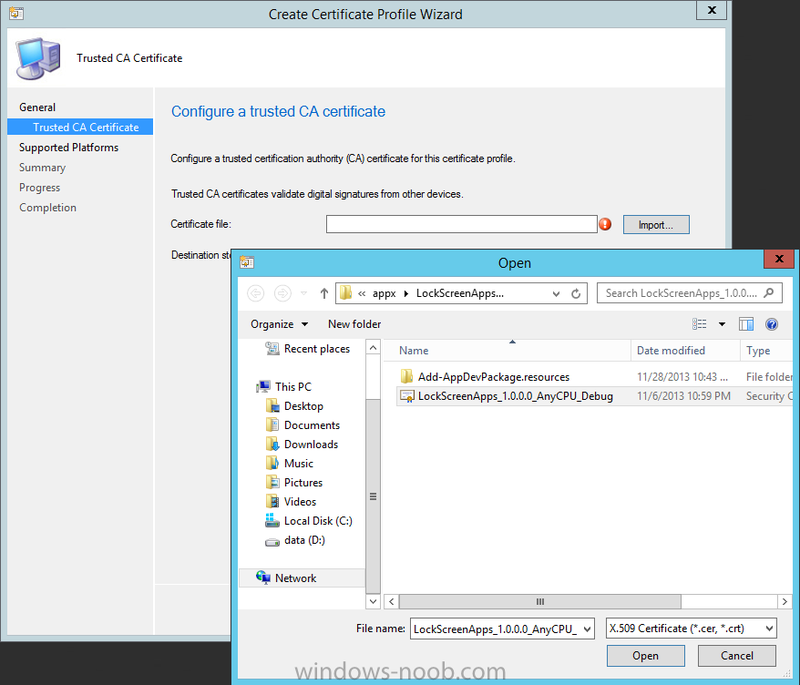 On the left side you can see the Certificate properties of the self signed certificate in the sample Appx app highlighted, you can bring up the Certificate Properties by double clicking on the certificate in the sample Appx folder, and on the right side we have the Certificate Properties of the Certificate we Deployed to our Windows 8.1 device in Step 3 above. 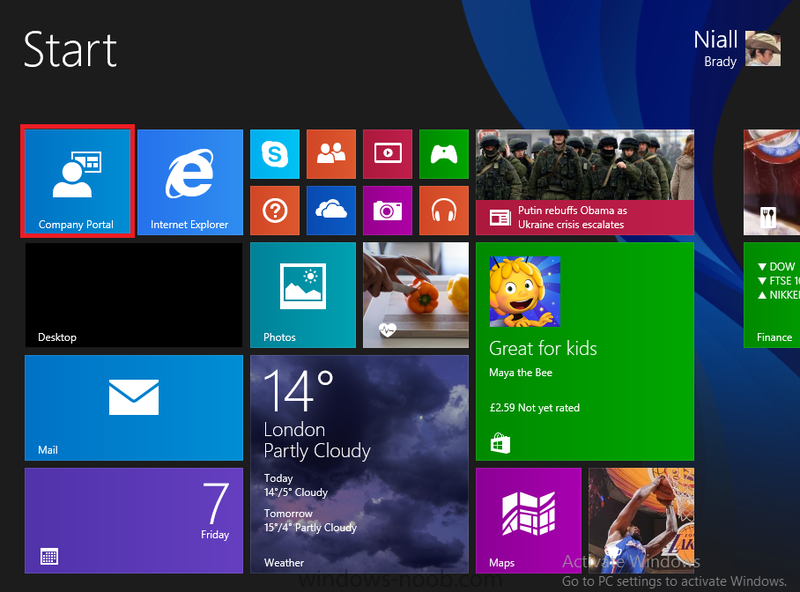 If you look closely, they match. 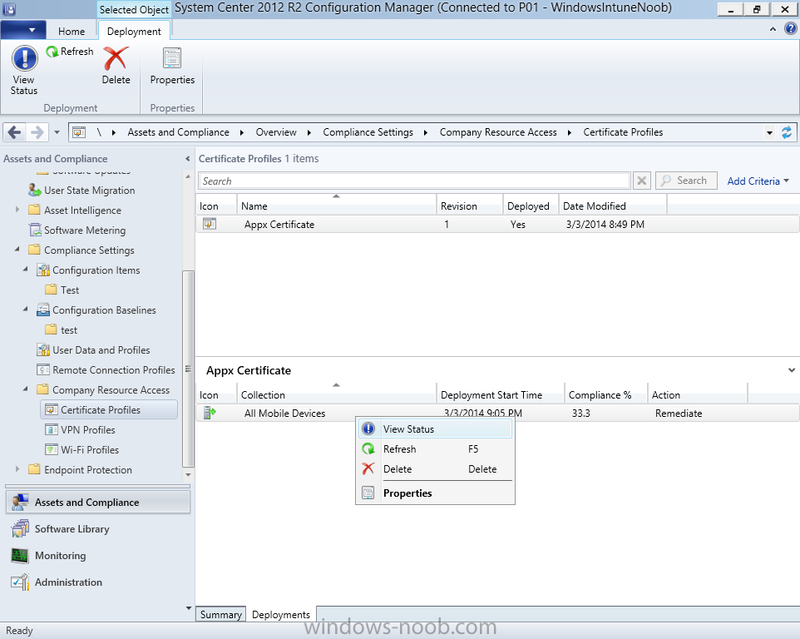 which will bring you to the monitoring node and allow you to dig deeper in terms of successful deployments etc, the screenshot below shows the successful deployment of the certificate used above on one of the 3 Windows 8.1 devices used in this lab. 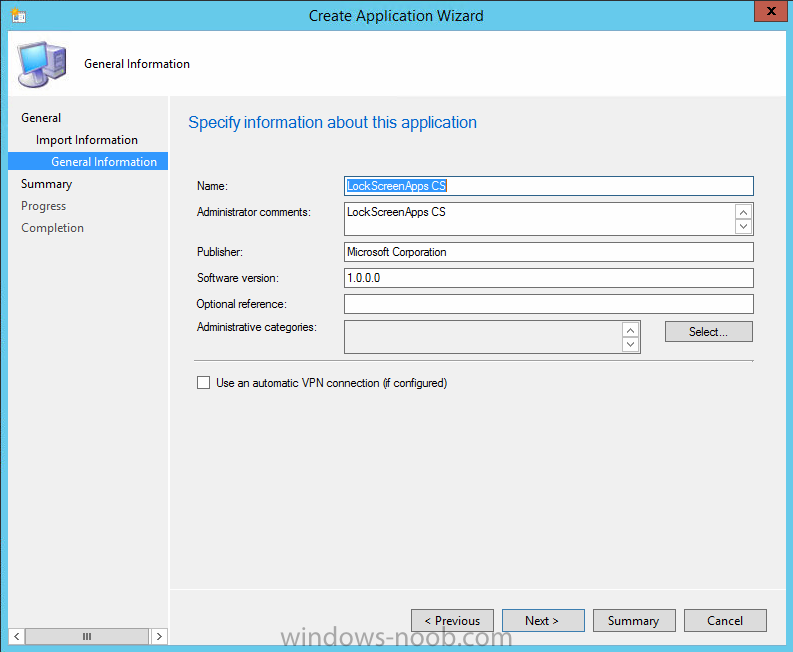 On the General Information screen add any changes you need or just click next to continue, note that you can also select to Use an Automatic VPN connection (if configured), this feature is explained here. 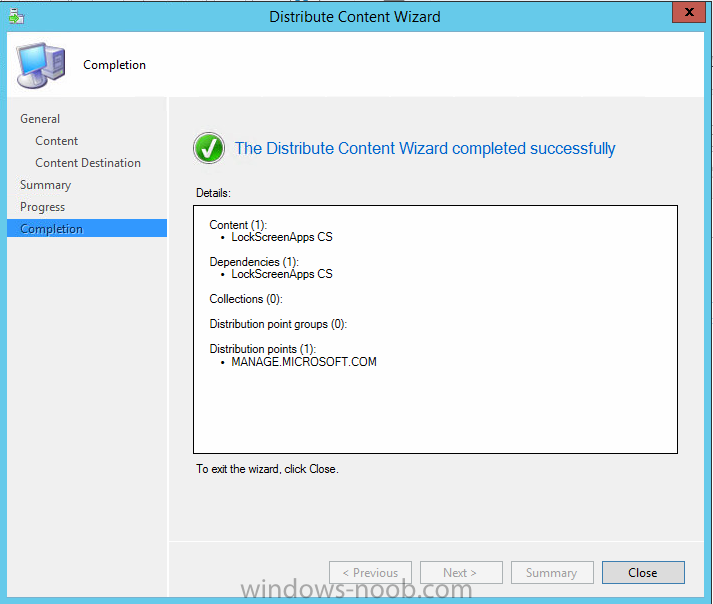 and click your way through the rest of the wizard, you can review the distmgr.log to verify it has distributed the content. 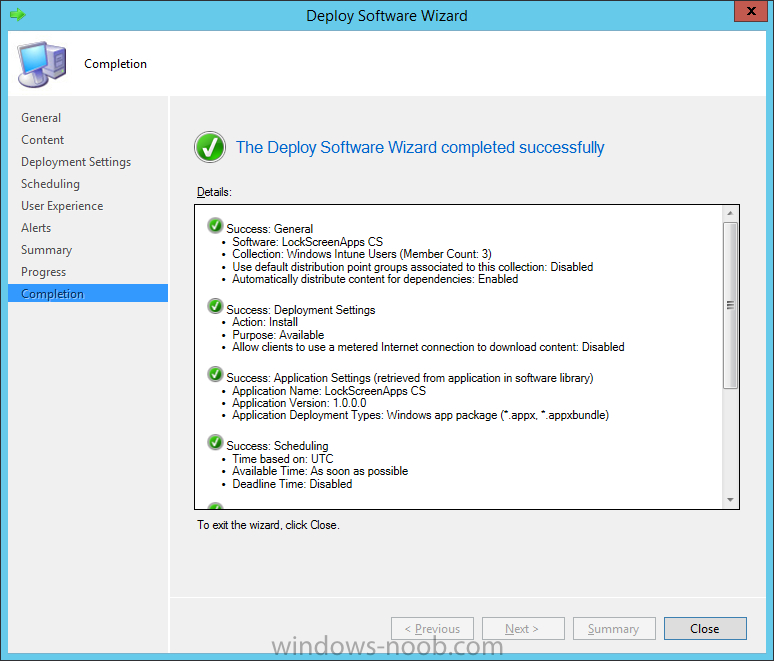 and if everything is ok it will install. 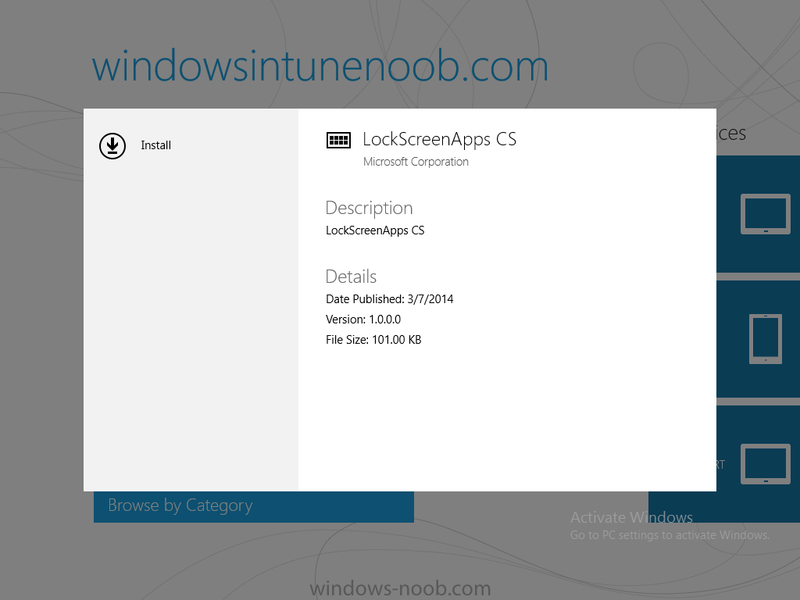 Note: I do not have any sideloading keys and therefore cannot show you the completion of this appx installation. 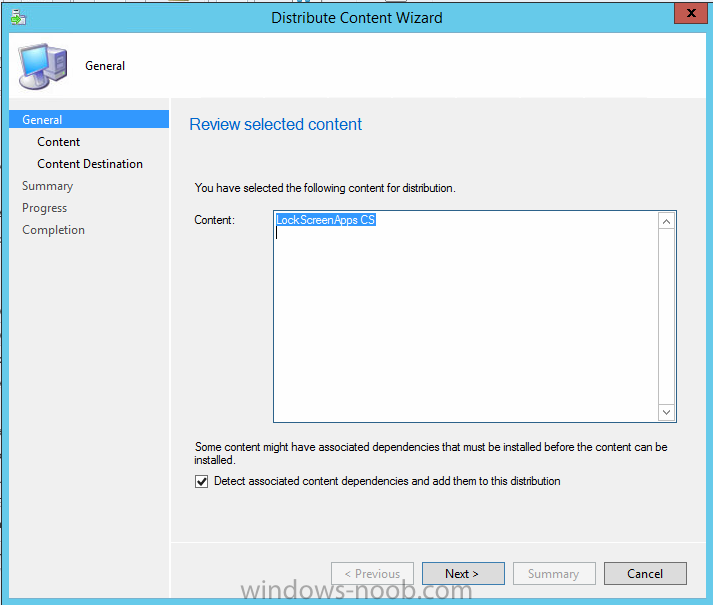 and verify the status such as in the screenshot below, the status of 78(120) means SideLoading key is required, to get a list of what these status codes mean see this post. 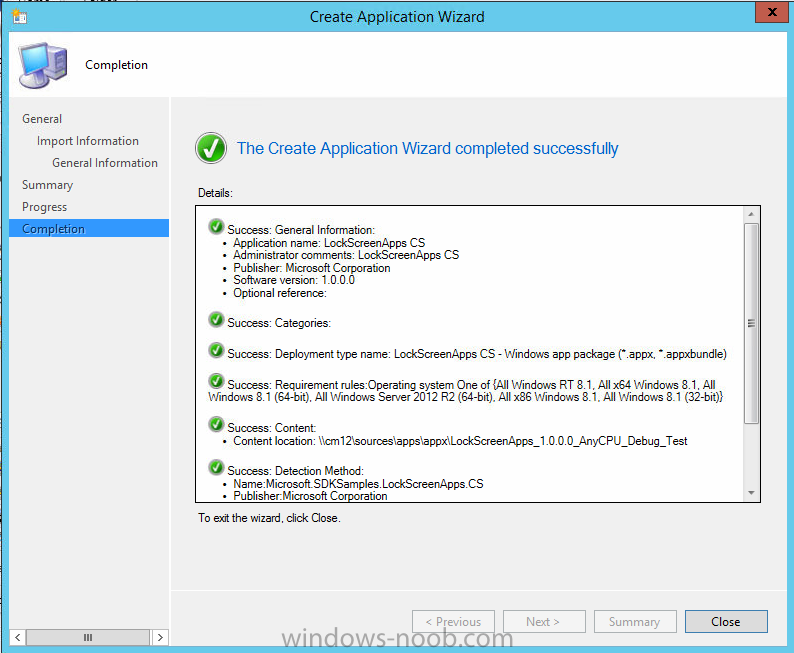 You can also check that the .appx application has been signed by the correct authority. 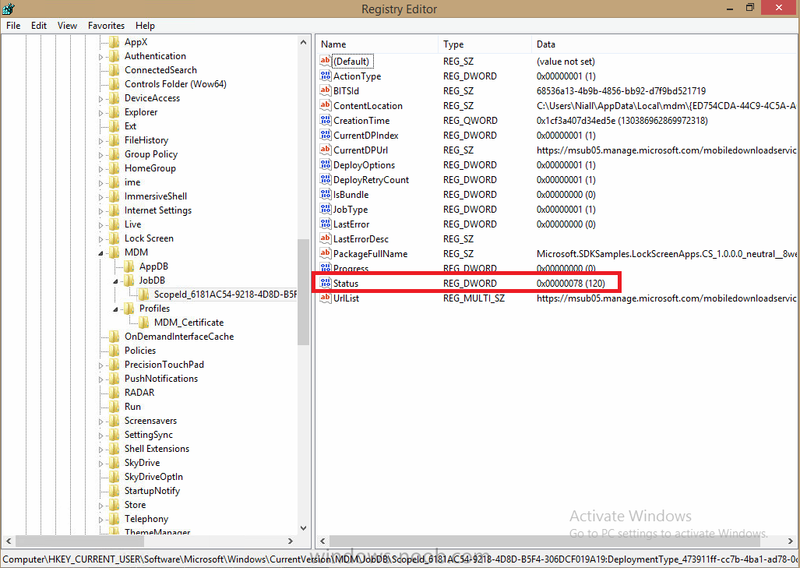 To do this, make a copy of the appx app, and rename the copied .appx file to .zip and unzip the files. Open the AppxManifest.xml within the extracted files using notepad and check both the Identity parameter and Publisher value. 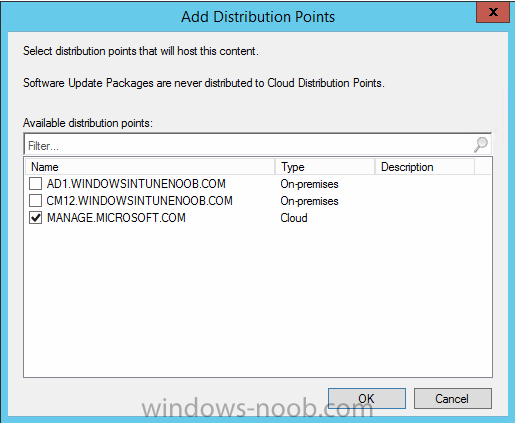 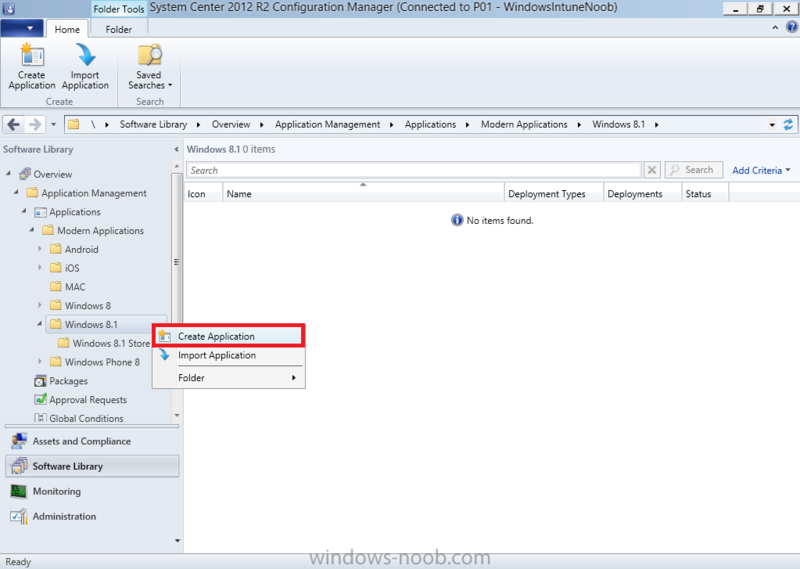 Installing Appx apps on Windows 8.1 devices using Windows Intune Integration in Configuration Manager 2012 R2 is not as straightforward as you would think, there are quite a few requirements on the client which in some cases need to be resolved outside of Configuration Manager/Windows Intune due to current capabilities. 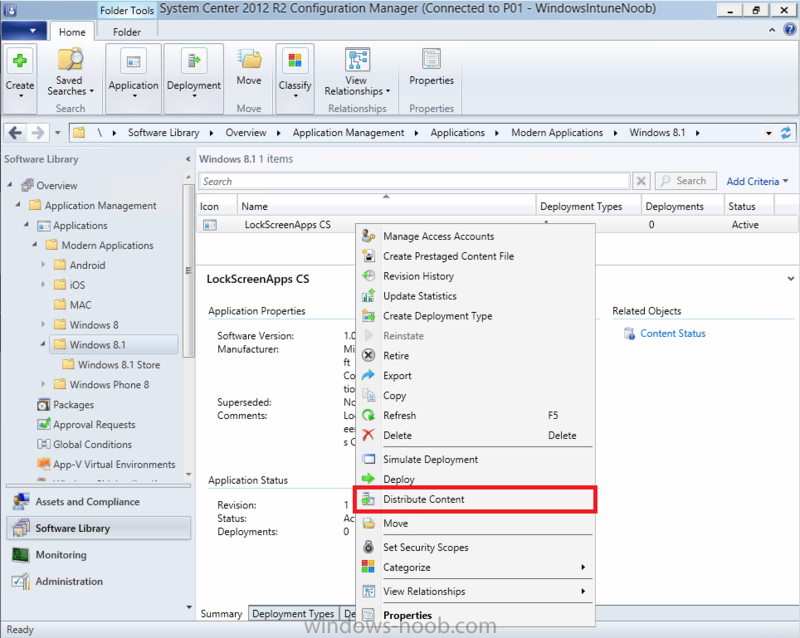 However once those requirements are in place you can use the Company Portal as your online 'store' in the cloud and manage everything via System Center 2012 R2 Configuration Manager. Special thanks to Wally and Panu for their advice on this guide. Simple questions that I can't seem to find the answer to, but is it possible to deploy just standard .EXE or .MSI installs. 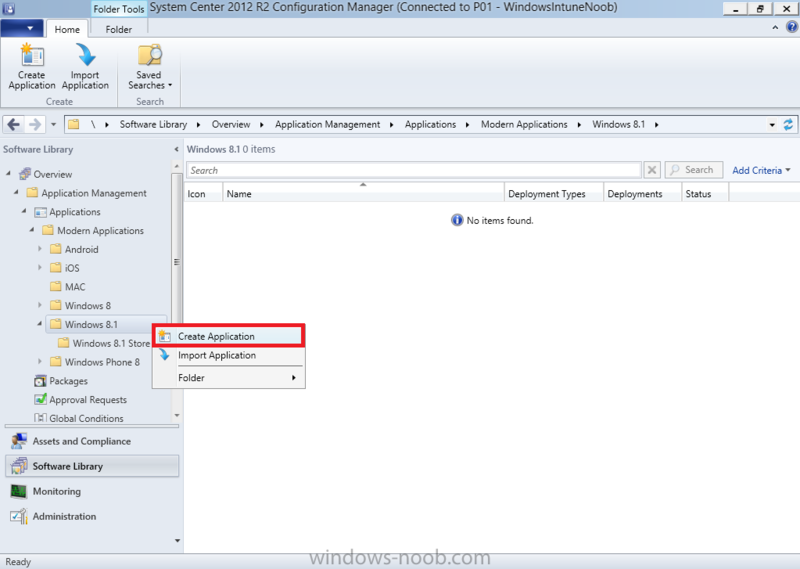 Things setup as either Applications or Packages in SCCM 2012? 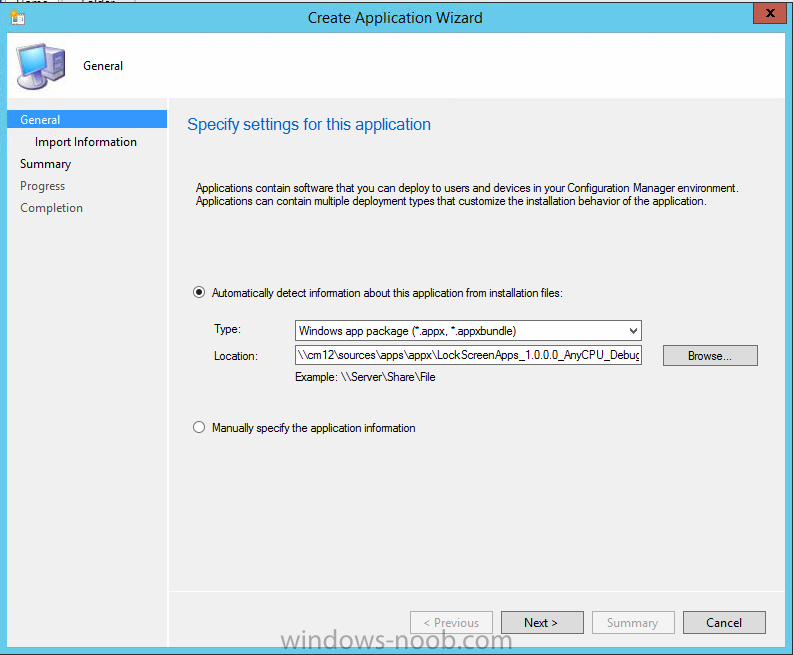 Or is it only "Modern" or AppX applications?